Then why are they talking about computer science? Well, let me introduce myself before I scare you away with a possibly foreign concept. I study Computer Science and Business at Lehigh University and have recently joined UPRAISE as an intern for the summer. While both computer science and business are broad topics, I enjoy data mining and marketing in their respective fields. Now, let’s get back to the topic at hand: computer science, and why it matters to a public relations agency. To address why computer science is important to marketing and businesses, let’s outline some of the basics of computer science. First, the breakdown of what “computer science” really is. 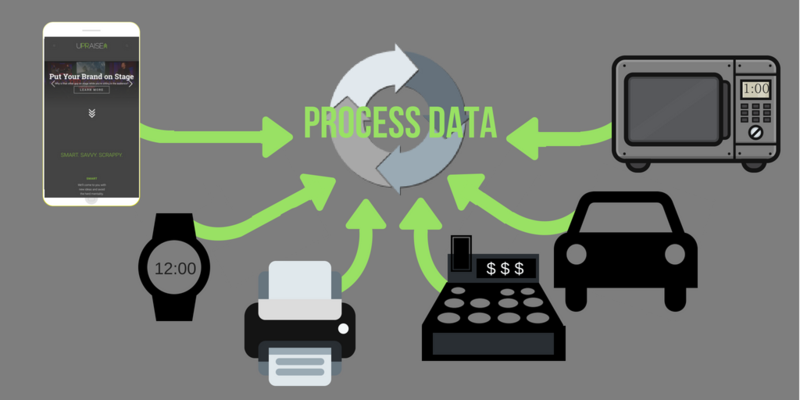 The principle of a computer in our world today is to process data. Whatever method you are currently using to read this article came from some device that processed data and presented it nicely to you. 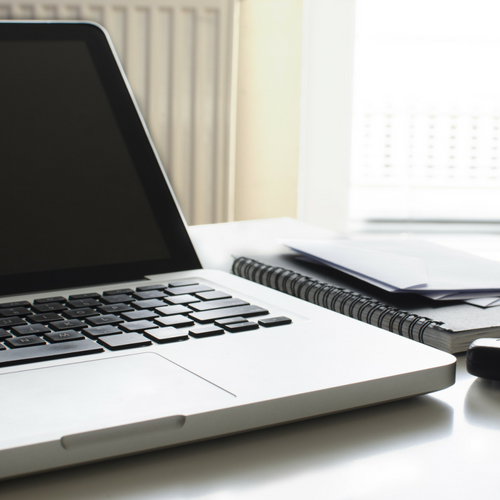 Many of our daily tasks involve a computer which makes the work we do easier and faster. Computer science is the research and application of the design and use of computers. Whether it be a four-function calculator or rocket ship, computer science is what helps drive today’s technological innovation. 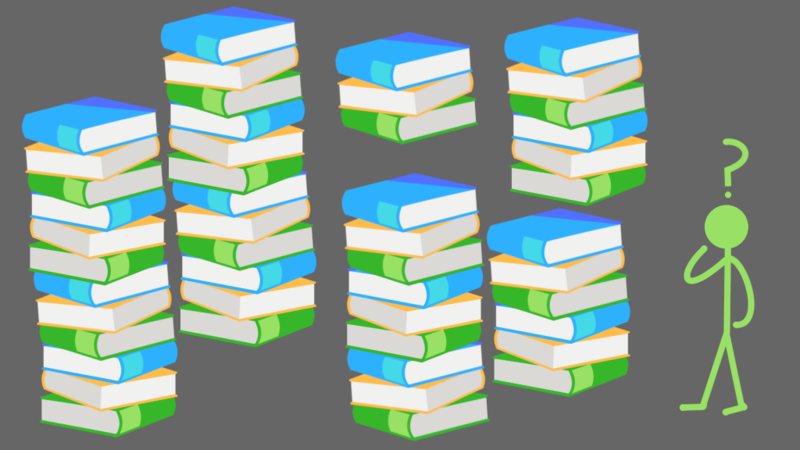 When you think of computer science, you may think of someone coding, but there is a systematic approach to the project at hand. Coding is just one step to translate ideas and problems from the real world into the computer. Everyone has different methodologies to problem solve, but each method has a step-by-step process to get to the end product. We can apply that basic process to anything, allowing us to take complex problems and give it to a computer to solve. If you cannot utilize and process information from the data you have collected, the data is useless. This is where the integration of computer science and business thrives; we create better business decisions by using computer science to analyze the data we have gathered from a business-oriented standpoint. Twitter, Facebook, LinkedIn, and Instagram all give us a small taste of the data they collect, like how many retweets your post had and how many people have liked your page. They recognize that modern businesses of today want to tap into their data and utilize the information they can gain. Application of Computer Science and Business. Let’s use Twitter as an example. We want to tweet about an event in a city that will launch an indestructible carabiner that can be used for both rock climbing and scuba diving. Twitter offers an Advertising API (applied programming interface) for businesses to gain more insight about their tweets. 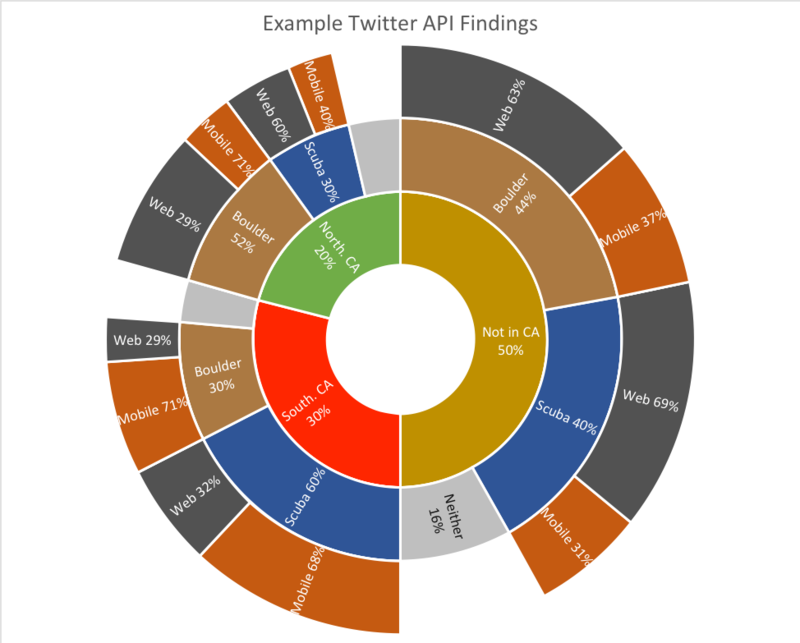 We want to use the API to find out from that tweet, where the user is located, what types of activities they are involved with, and what application they use to tweet. Back to the four V’s. We all know there are large number of Twitter users, volume, people are constantly joining twitter and tweeting, velocity, and of those users and tweets are unique (for the most part), variety. But what about uncertainty of information, veracity? The information from Twitter can’t tell us whether or not a person is interested in scuba diving or rock climbing; so, we create some code. We can take tweets from people who liked our original tweet and see if they talk more about diving or climbing. We can generate word clouds to create a list of the popular words that are associated with each activity, such as “scuba” or “boulder”. Then, we can make an educated guess if a user is more likely to scuba dive or rock climb based upon how many times those key words are found. There is still an uncertainty about a user’s preference, but the code gives us more data to analyze. In the end, we can better represent our audience by using computer science to create data that is not directly given to us. Based on this information, we can make better business decisions. Since 30% of the people are from Southern California, we should host our event on the waterfront of San Diego. We can also offer mobile device accessories with our logo due to 68% of the scuba subset used the mobile application. If we wanted to host our event in Northern California, we should host near rock climbing facilities in Oakland and hand out stickers for laptops. Whatever choice we come to, we can use data to support our decisions. It seems trivial to make business decisions based on those percentages, but computer science can take more variables into account. In the marketing world, we ask what if… What if we decide to tweet today? What if we tweet at 8:00 AM instead of 3:00 PM? Should we use Facebook instead? Details matter! When you have such small windows of opportunities, you must account for every small change you could make to maximize value. Complex formulas and algorithms can incorporate thousands of variables, helping you create the optimal decision faster. A new problem may arise, but you can change your code to address the issue. 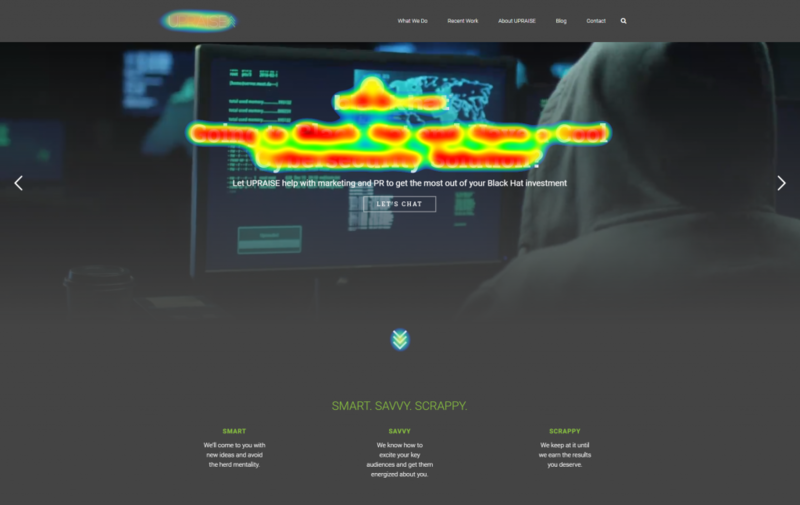 Computer scientists have started looking past “classic” data by creating new tools to generate unique data; for instance, we are capable of using eye tracking technology to help our visual marketing. Using the UPRAISE Marketing and Public Relations agency website as an example, we can generate a “heat map” of where people will look when they land on our home page. 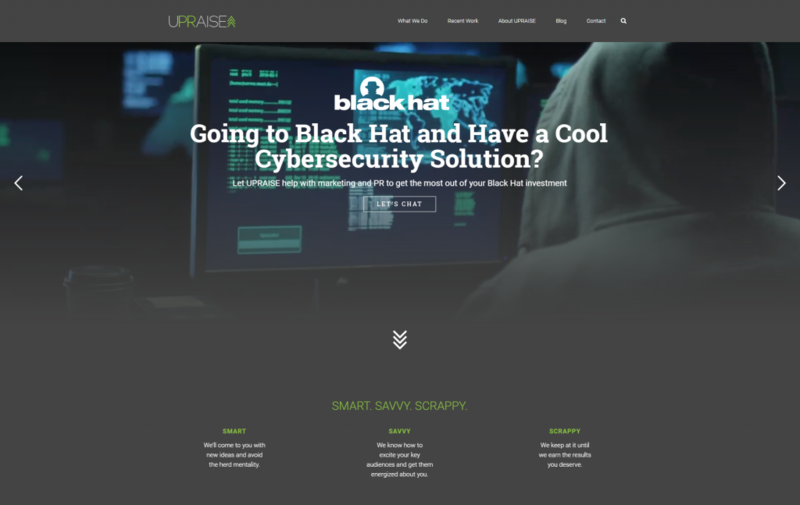 From these images, the heat map highlights our Black Hat banner title and UPRAISE logo. Although logo recognition is important to a company, we currently want to focus more on the upcoming cybersecurity event. This information lets us know that the banner is gaining more viewer engagement than the rest of the page, while still retaining some logo engagement. If we want to push our brand out more, then we adjust the page accordingly. Heat maps help businesses determine how their media interacts with viewers. With new implementations of computer science, we can use new technology to make our marketing more efficient. The beauty of computer science is that it can adapt and evolve to your needs. Our world is constantly developing new technology and with that comes a constant flow of data. Programmers can consolidate data from social media, your own business, other business performances, historic trends, and more to help create better informed business decisions. A business that has integrated computer science will gain the competitive edge. The development of complex algorithms that create more accurate results and new technology pose a threat to other companies. Computer science is becoming a stronger platform for businesses to push ahead among their competitors.